University students have average attention spans of just 10 minutes and many miss lectures because of the need for part-time jobs, research suggests. Many are ill-prepared for both learning and living a modern university life, the survey of 1,000 students claims. A quarter struggle to manage money and to live independently, says the survey for the technology firm Olympus. 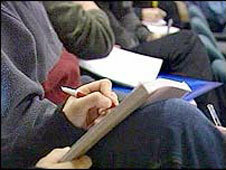 Nearly half of students feared they would finish with high debts and no jobs, according to the study. The survey suggested that when it came to adjusting to student life, money and lectures were the biggest hurdle. The average length of time a student could concentrate for in lectures was 10 minutes, according to the survey carried last month. And a third blamed lack of sleep and being overworked for this. Many students had been forced to take up part-time work to make ends meet. Among the students surveyed, 13% admitted to missing up to five hours of lectures a week, while 17% said they had to prioritise their part-time jobs over lectures to be able to support themselves. Many said their work had been affected by taking a job, with 21% finding they were struggling to complete their work on time. Meanwhile one in 10 said they feared their university degree would be a waste of money, with almost a quarter believing they will not stand out to employers once the graduate. National Union of Students president Wes Streeting said: "Given that students are graduating with record levels of debt, and job prospects are at an all-time low, it is no surprise that so many are having to take on part-time work which is adversely affecting their studies."